I’m an utter romantic. Ask anyone of my friends and they’ll agree with me. I love thinking that my soul mate is out there somewhere, looking for me too. I love to be romanced. I think that’s why this story makes me happy. It about having that brief moment’s kiss a stranger who turns your world upside down. Makes you feel things. But then he has to run off before you get his name, or learn anything about him. But he’s all you can think about because you knew, in that moment, you both felt the same way, despite it only being a kiss. 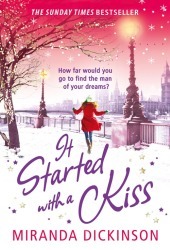 I loved the journey and focus that Romilly had for trying to find her knight in shining armor and the guy who blew her away with just one kiss. She gives herself a year to find him and if she doesn’t find him, she’ll get over her quest and get on with her life. She has support all over te place, from her friends, to her aunt and uncle, even a massive follow on her blog for her search of him. She yes, this is the book that makes me happy and makes me think that (although its fiction) if that happened to me, that i;d have the support and determination Romilly had to find her perfect guy despite not knowing a single thing about him, but wanting to find out who he was and if he felt the sparks she did too.